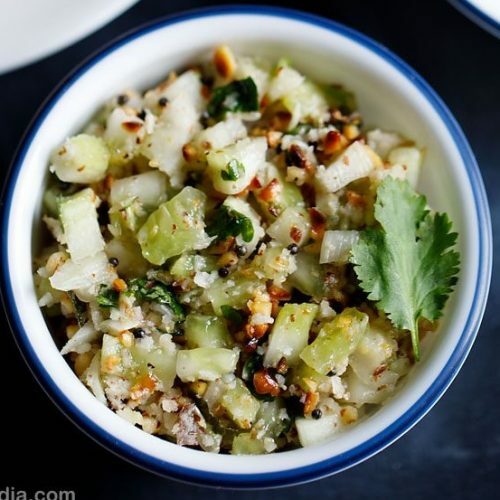 khamang kakdi is a popular maharashtrian cucumber salad. also known as kakdi chi koshimbir. khamang kakdi recipe with step by step pics. 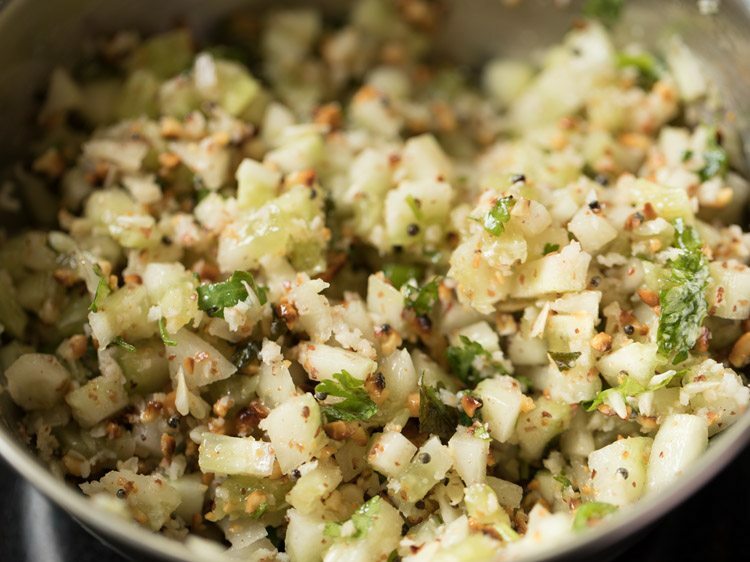 khamang kakdi is a delicious lightly spiced crunchy cucumber salad from the maharashtrian cuisine. 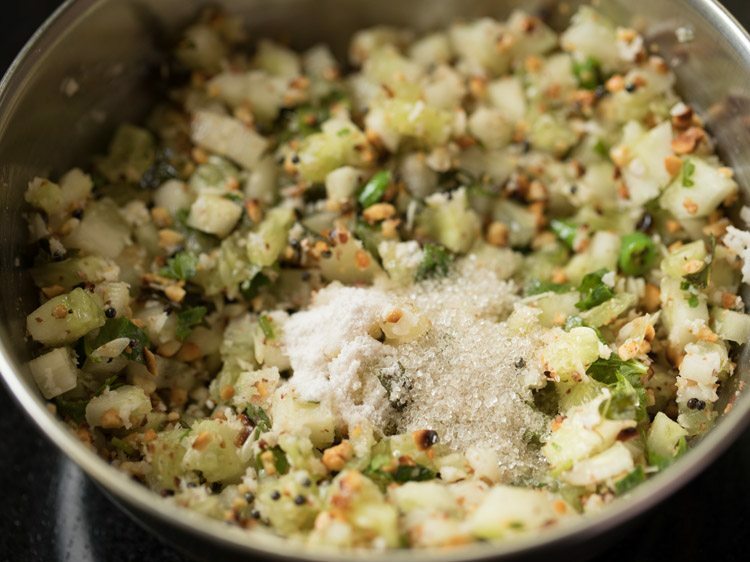 its also known as kakdi chi koshimbir which in marathi language means, salad (koshimbir) made from cucumber (kakdi). 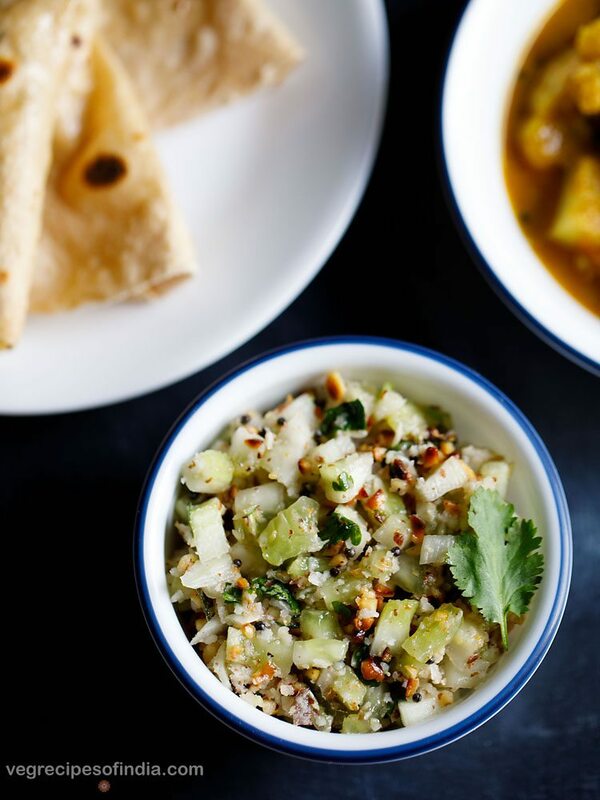 cucumber, fresh coconut, roasted peanuts, lemon juice & green chilies are tempered with mustard & curry leaves. 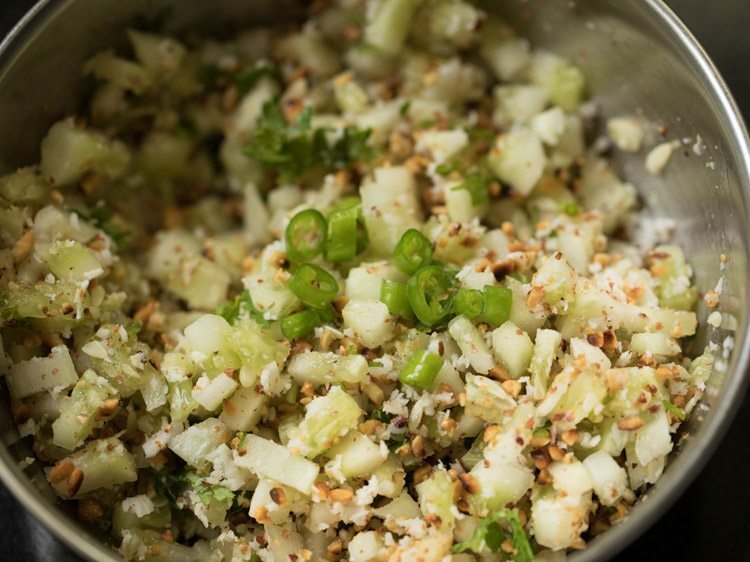 so you can imagine what tastes, flavors & textures this cucumber salad must be having. in fact it is so good, that you can just have it plain. 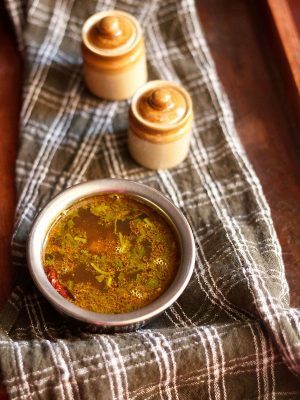 you can even serve khamang kakdi as a side dish with any vegetarian maharashtrian meal like varan bhaat or usal or vangi bhath or bharli vangi or bharli bhindi. 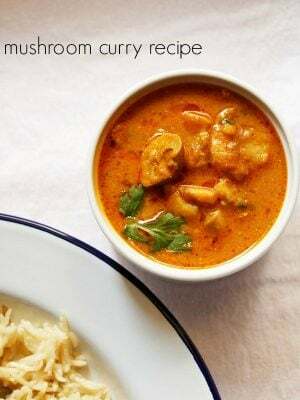 this is a very easy recipe and gets done quickly. so when you want to have refreshing and light food between meals, then this khamang kakdi is an option. if you are looking for more maharashtrian recipes then do check poori bhaji, ukadiche modak, fried modak, puran poli, coconut ladoo and thalipeeth recipe. 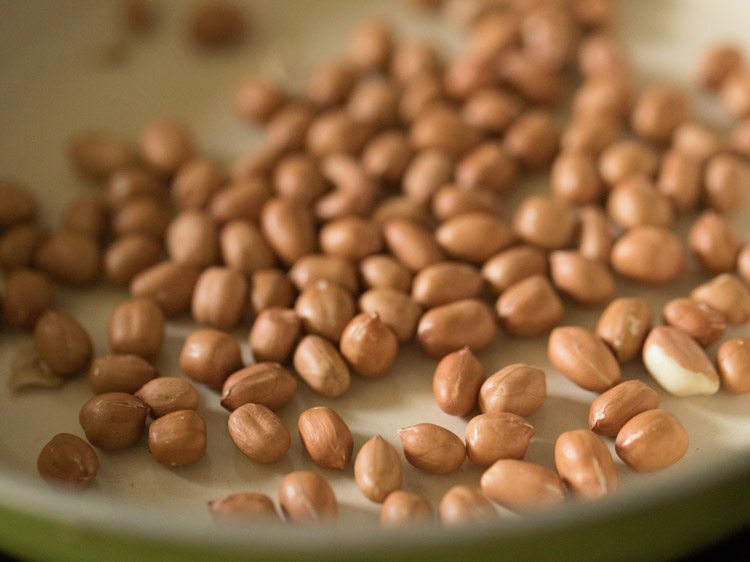 heat a small pan and add ¼ cup peanuts. on a low flame stirring often roast the peanuts. the peanuts should have a few black spots on them and should be well roasted. keep them aside till they are cooled completely. rinse 2 medium sized cucumbers. chop them finely. 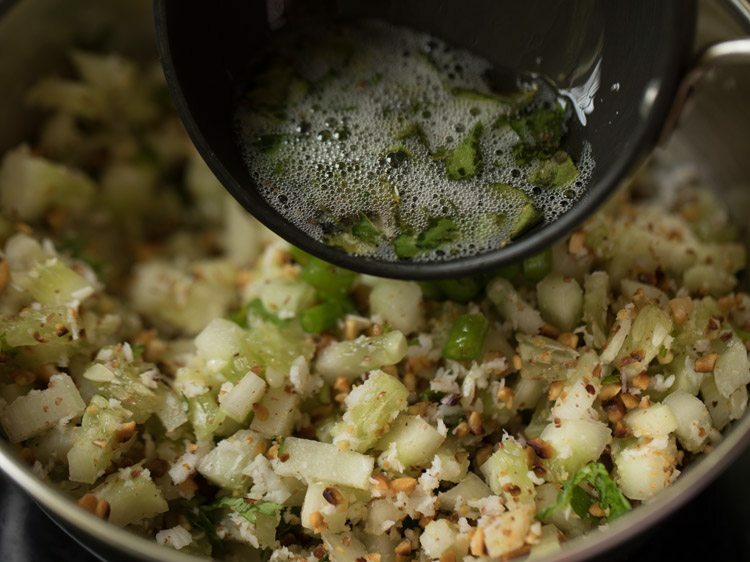 you will need about 2 cups of finely chopped cucumber. keep the chopped cucumber aside for 15 to 20 minutes in a bowl or plate. meanwhile when the peanuts cool down, remove the skin from the peanuts. 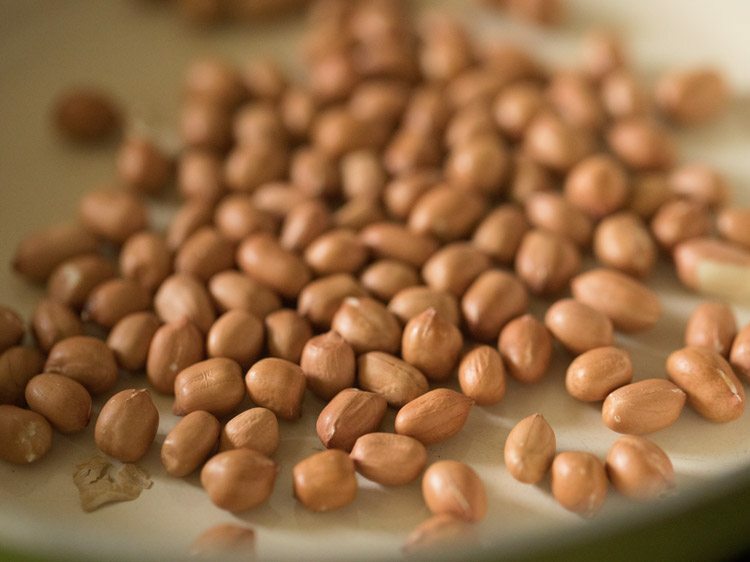 just rub them between your palms and the peanut skin will come out easily. add the peanuts in a mortar-pestle. crush to a coarse powder. 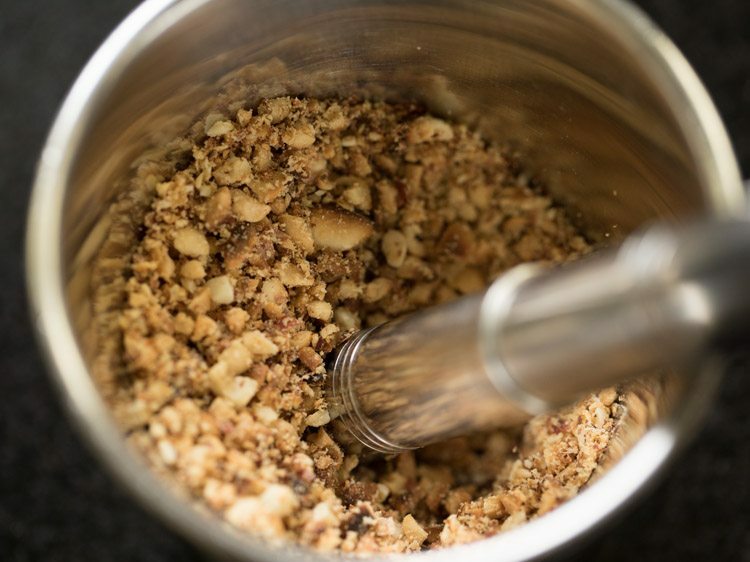 you can even crush peanuts in a small mixer-grinder jar. 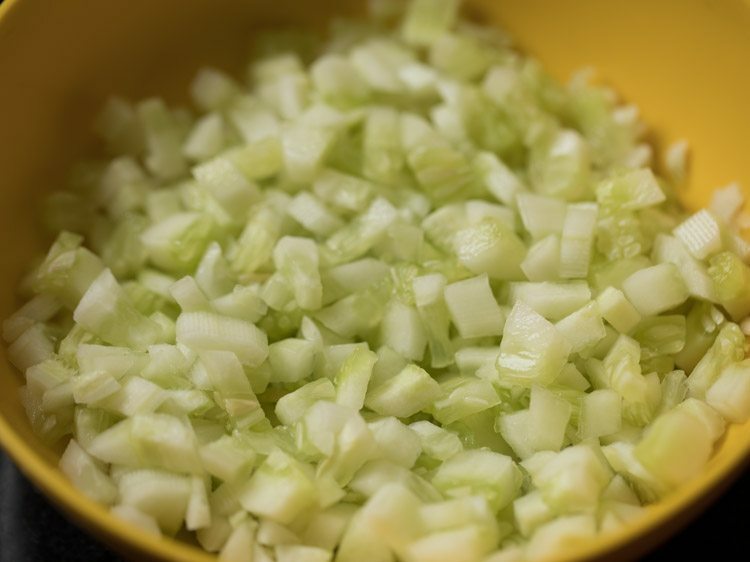 after 15 to 20 minutes squeeze water from the cucumber and add them all in a mixing bowl. add the coarsely crushed peanuts. 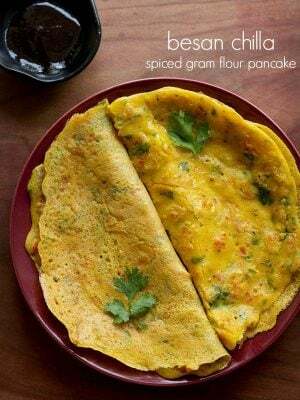 add ¼ cup fresh grated coconut, 1 green chili (chopped), 1 tablespoon chopped coriander leaves and 1 teaspoon lemon juice. you can add less or more lemon juice as required. 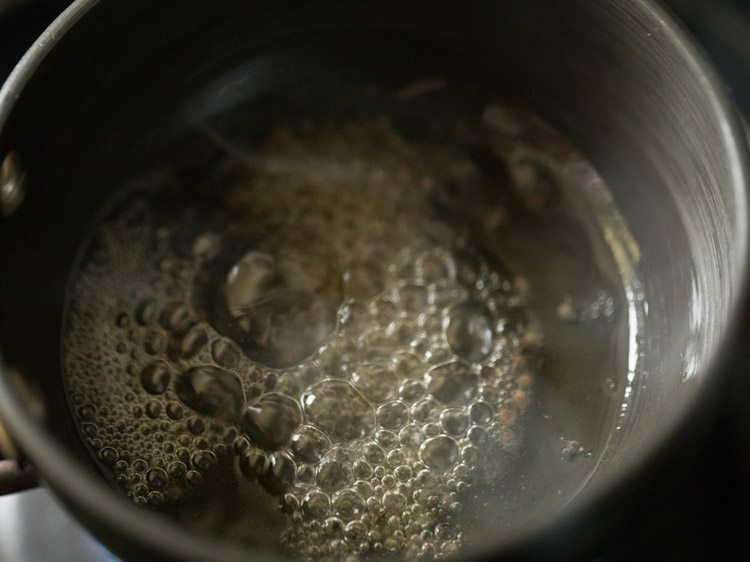 heat 1 tablespoon oil in a tadka pan or small pan. add ½ teaspoon mustard seeds and let them crackle. when the mustard seeds finish crackling, add 7 to 8 curry leaves (chopped or whole). stir and then switch off the flame. pour the tempering mixture in the cucumber mixture. mix very well. now you can keep the khamang kakdi mixture in the fridge if not serving. just before serving add some sugar and salt as per taste. mix well and then serve khamang kakdi. 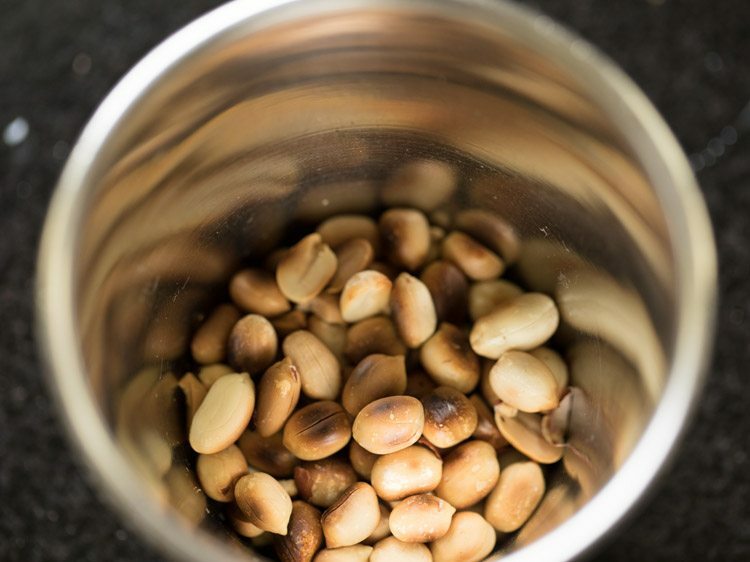 1. heat a small pan and add ¼ cup peanuts. 2. on a low flame stirring often roast the peanuts. 3. the peanuts should have a few black spots on them and should be well roasted. keep them aside till they are cooled completely. 4. rinse 2 medium sized cucumbers. chop them finely. 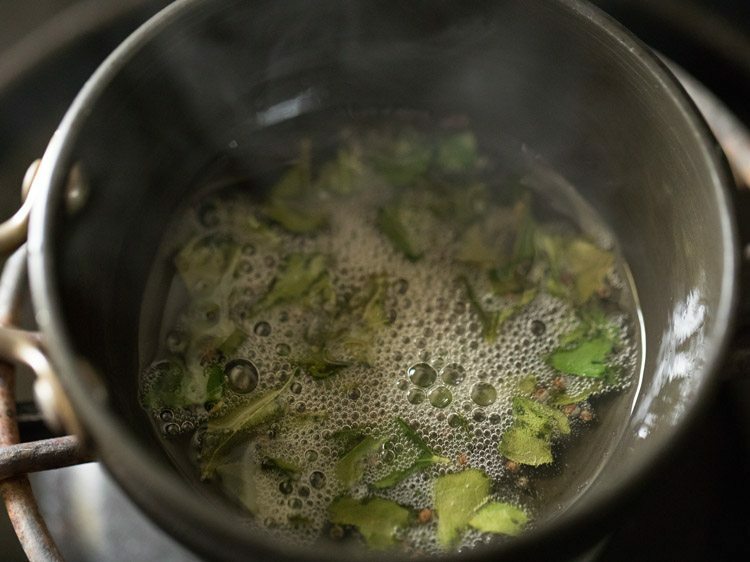 you will need about 2 cups of finely chopped cucumber. 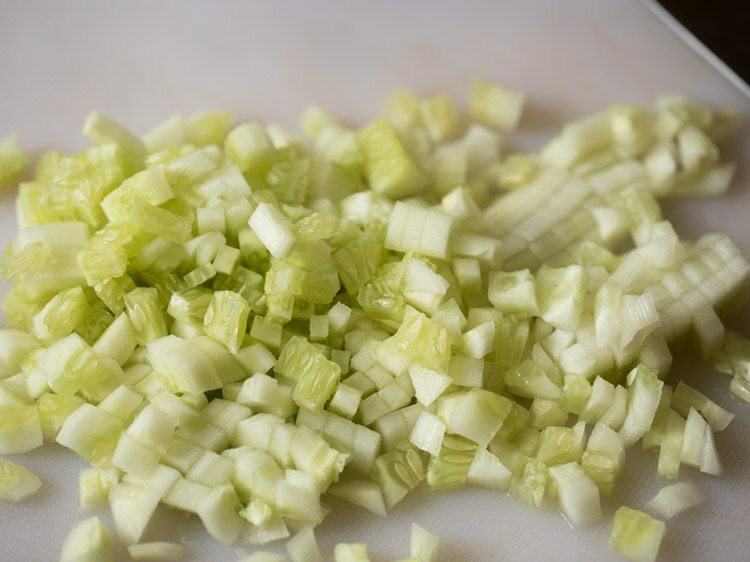 5. keep the chopped cucumber aside for 15 to 20 minutes in a bowl or plate. 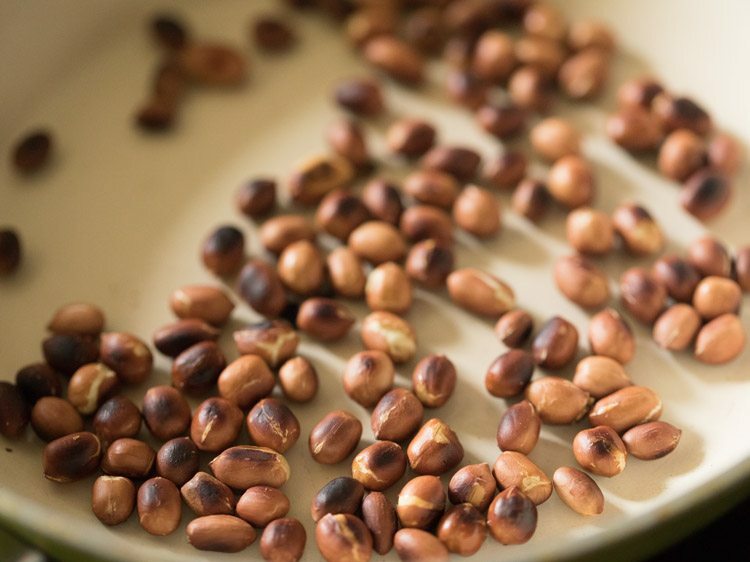 6. meanwhile when the peanuts cool down, remove the skin from the peanuts. just rub them between your palms and the skin comes out easily. add the peanuts in a mortar-pestle. 7. crush to a coarse powder. you can even crush peanuts in a small mixer-grinder jar. 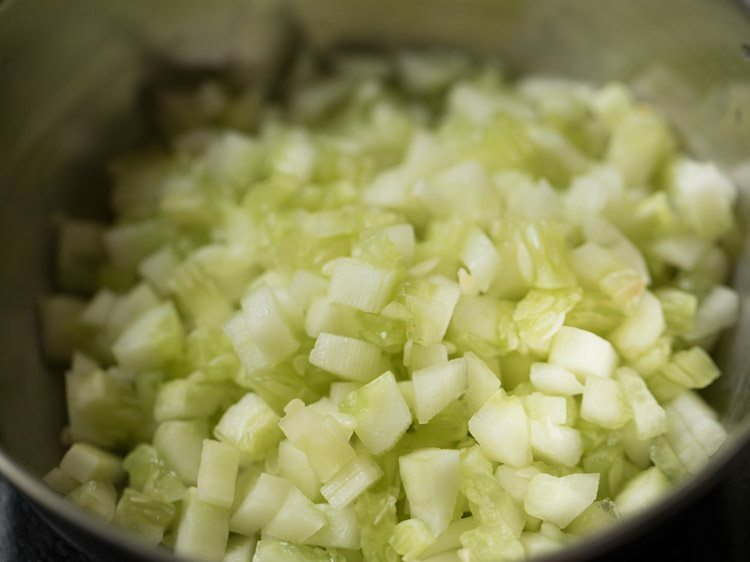 8. after 15 to 20 minutes squeeze water from the cucumber and add them all in a mixing bowl. 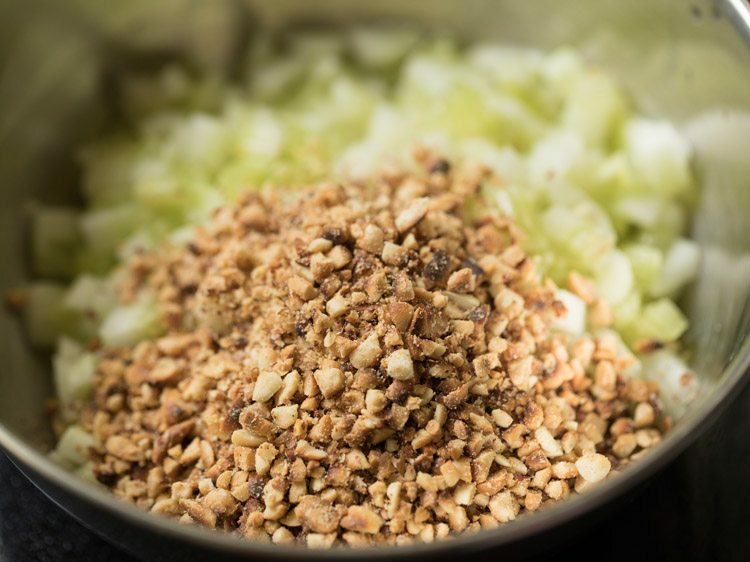 9. add the coarsely crushed peanuts. 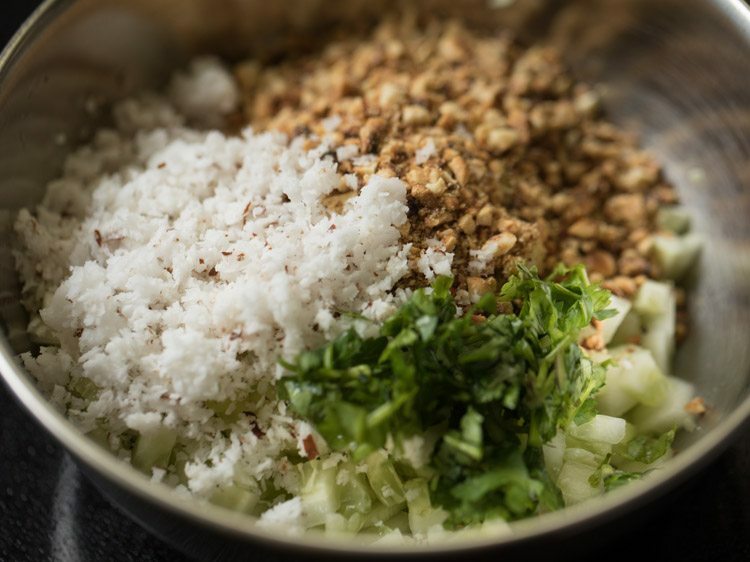 10. add ¼ cup fresh grated coconut, 1 tablespoon chopped coriander leaves and 1 teaspoon lemon juice. you can add less or more lemon juice as required. 12. add 1 green chili (chopped) and mix again. 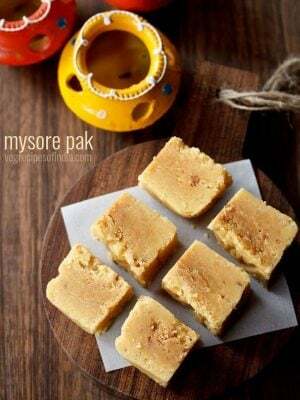 13. heat 1 tablespoon oil in a tadka pan or small pan. add ½ teaspoon mustard seeds and let them crackle. 14. when the mustard seeds finish crackling, add 7 to 8 curry leaves (chopped or whole). stir and then switch off the flame. 15. pour the tempering mixture in the cucumber mixture. 16. mix very well. now you can keep the khamang kakdi mixture in the fridge if not serving immediately. 17. just before serving add some sugar and salt as per taste. 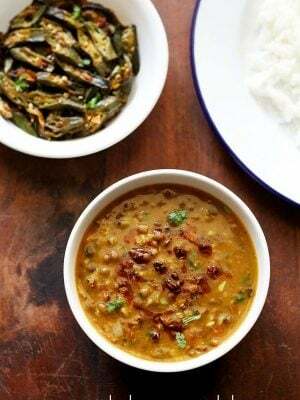 19. serve khamang kakdi plain or as a side dish with any maharashtrian meal. cooking competition. She won the first prize. I could not resist myself to share this with you. Thank you. thanks nalini for sharing this. nice to know and glad too. regards to you and your daughter. the khamang kakdi tastes very good. Hi, I have recently subscribed to your newsletters.You are a wonderful cook and thanks to you, okay cooks like us can dish out delicious recipes.Keep up the good work and God bless you always..
thanks a lot rupam. i am a good cook but i also meet with disasters at times. thanks for the lovely words, though. Hi Dassana ! went through your recipe of Cucumber Salad. The recipe sounds interesting,yummy & liplicious.But i want to know as to how many calories are there in ONE CUP of this salad? Secondly,coconut and peanuts have too many calories & hence forbidden for people who are OBESE & having OSTEOARTHRITIS, in such a situation what other ingredient can be added in this salad ? Thanks. hi rewa. i don’t know how many calories are in 1 cup of this salad. the flavors in this salad mainly come from coconut and peanuts. a suggestion would be to avoid coconut and add seeds like roasted sunflower seeds, pumpkin seeds, melon seeds, flax seeds or sesame seeds. in fact you can roast all the seeds and add them. the coconut would be missing but the crunch in the salad would be still there due to the seeds. 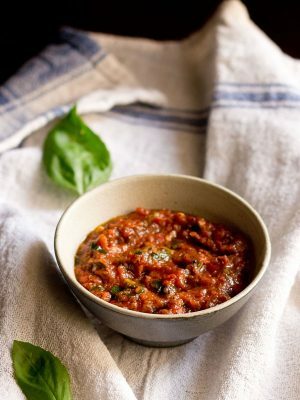 Thank you 4 the awsum receipe,try a variation of little less curry leaves nd add fresh blocks of cottage cheese nd or cashew nuts ….. Hope your camera is fixed soon nd keep dem receipies cummin mwahh. Hope your camera is back to ur hands soon..
Hey you re-did your blog, right? I am not crazy–I hope! Looks wonderful! thanks laura. yes we made some changes to the blog. This is my favorite salad. Khamang kakdi, varan- bhaat and batata bhaji. Wow, the perfect meal. Your salad looks wonderful . Going to make it today! Hi Asmita can you tell me what is VARAN-BHAAT? and how is it made? if i get this recipe i will try it & let you know.Thanks. on google search you will find many varan recipes that do not add coconut. Oh the camera not working is a nightmare and so frustrating too. 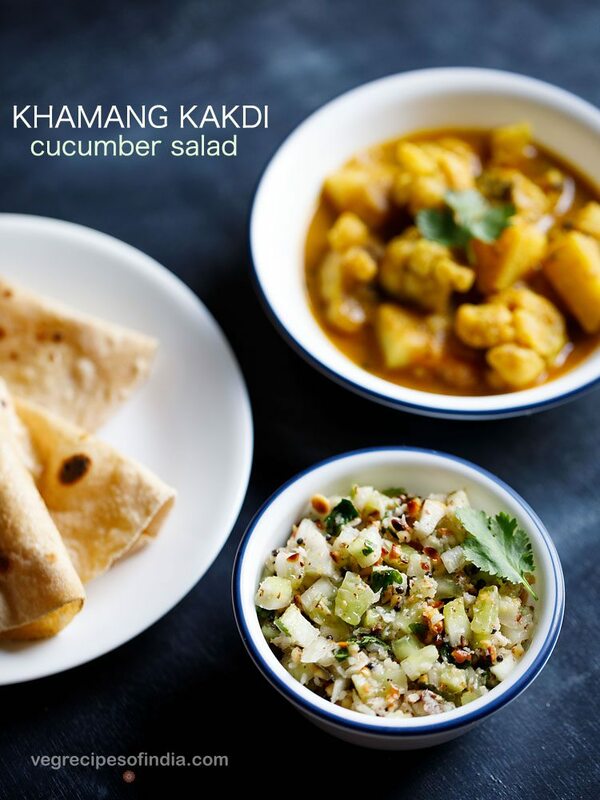 I love making Khaman salads with cucumber and carrot mix. Lovely picture as always. 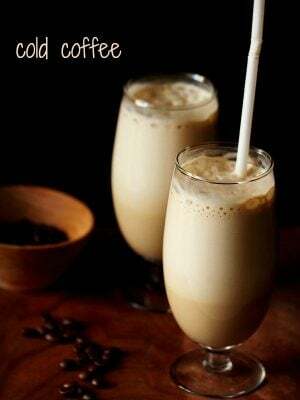 Thanks for posting this recipe coz it has been a while since I made this!!! And yes, even I love to have it all by itself, also it is a simple dish to make especially when I am tired of making any bhaji during summers!! Just a point…. I believe it is good idea to use ‘Vili’, i.e our traditional equipment for cutting/ chopping, to cut the cucumber. 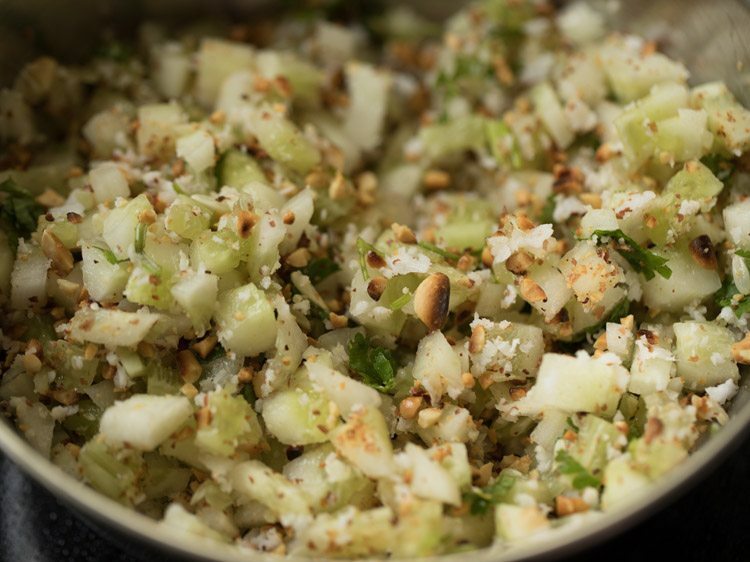 The word we use is ‘kakdi chochavne’ where the cucumber is first given random vertical cuts and then chopped (difficult to explain but I am sure u already know this). We also follow this method for making kobi pachadi. Sorry to take up so much space, but couldn’t help commenting! hi suruchi, the camera not working at the festive time is really a dampener for me. i know about vili. at home my mom still uses this traditional tool for cutting some veggies. i have seen one of my maharashtrian neighbors doing the method you have described above. it is alright if you comment a lot. i will be updating the info you have given in the post soon. I liked the new change to your blog… sad to know about your camera also nice delicious healthy recipe. Take care and looking forward for more recipes ! Never heard or tried this cucumber salad. I will try soon. Need to stock up some ingredients first. 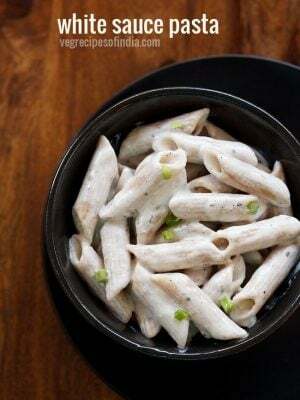 Very healthy and nutritious kamang kakdi recipe. The Pic is so beautiful with the plants. I guess it was taken in balcony or garden. I hope your camera get repaired ASAP. 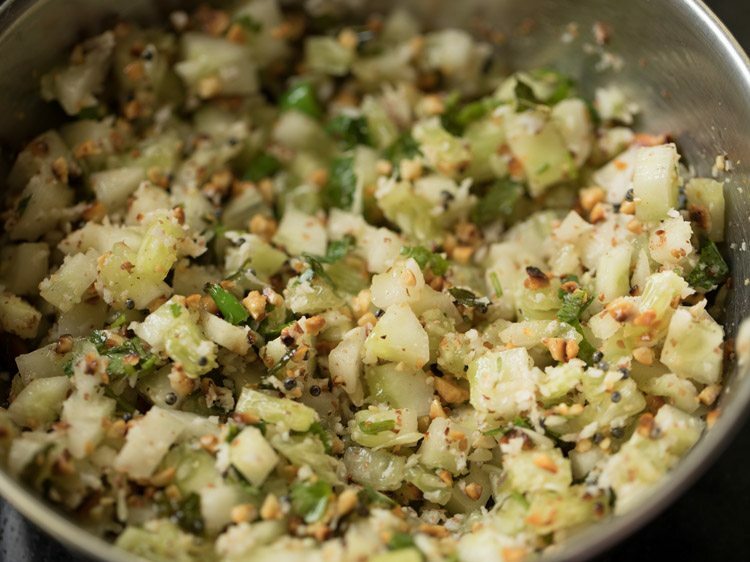 do make this cucumber salad. it is very good and you will like it also. it is the kitchen balcony. even i hope the camera gets done quickly. Looks lovely. The only problem would be the curry leaves, they are not standard to get here. you can make the salad without curry leaves. they do add a lot of flavor but still the salad can be made without them.